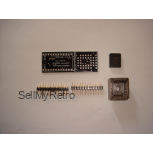 The item sold here is a DYI soldering kit and sold with a Microchip AT28C64B EEPROM. All parts are through-hole components, so it is easy to solder, even if you are a novice solderer. The adapter comes with round pins, so you can plug the adapter into both normal and precision IC sockets. The adapter also comes with an instruction manual. It is shipped empty. Would you rather prefer a pre-assembled adapter that is ready to plug in? Look here. Would you rather prefer bare PCBs? Look here.